Fully dressed in white, from bezel to dial to strap, with the new version of 42 again Superocean Breitling inspiration stirs the waters. Ultra tough, and waterproof up to ultrasportivo fabulous depth of 1500 m, this diver’s watch from the quenching of steel has already proved reliable sample of the wrists of those who love the thrill. In this new version of White Water Superocean 42 did not fail to seduce women who know how to combine elegance with performance, the audacity to excellence. This special series that looks fresh and original, available in exclusive boutiques Breitling , houses an automatic movement with chronometer certificate issued by the COSC (Swiss Official Chronometer Control). The unidirectional rotating bezel coated with white rubber and dial the numbers stand out clearly detected dynamic style. 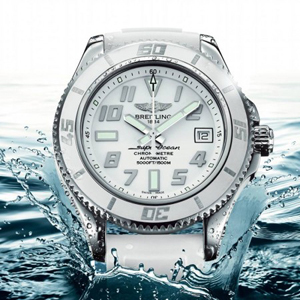 The thick sapphire crystal of the Superocean 42 White Water is antireflective on both sides. Robust lateral shoulders protect the screw crown, while a safety valve allows to balance the pressure difference between the outside and the inside of the case. You do not need to dive more safely through the waters and walk the streets of the world with absolute elegance. Bezel: Unidirectional rotating with arrest. Model: Rubber Diver Pro (with central relief) white.